A brutal intruder tried to murder a 79-year-old man in his home in a savage attack committed during a violent crime spree. Drink and drug fuelled Michael Jamieson launched an assault on Thomas Gray, after the pensioner opened his door, by punching him to the floor before stamping on him and trying to strangle him. Jamieson, 22, also attacked Mr Gray’s wife Margaret, also aged 79, as she desperately made a 999 phone call seeking help. He assaulted the couple after he went on a rampage in the West Lothian village of West Calder during which he attacked a total of seven victims. Jamieson, whose previous convictions include assault with a baseball bat, was on bail from Edinburgh Sheriff Court when he carried out the string of attacks on November 3 last year. He admitted attempting to murder Mr Gray at his home in Polbeth Road by repeatedly punching him, grabbing and compressing his neck restricting his breathing and repeatedly stamping on him to his severe injury and to the danger of his life. He also admitted assaulting Mrs Gray by grabbing her, trying to take her phone from her hand and repeatedly hitting her on the head. He also pled guilty to attacking Archibald Wade, 61, by biting him on the arm and attacking 82-year-old Alexander Faulkner by putting him in a headlock, pulling him to the ground, trying to strike him with a brick and repeatedly punching him. Jamieson also admitted assaulting Gordon Campbell at his home in Polbeth Crescent by trying to push him in a bid to gain entry. He further admitted assaulting Iain McClafferty by struggling with him, grabbing and punching him and trying to put him in a headlock. Jamieson also pled guilty to assaulting police constable Jennifer Sneddon at St John’s Hospital in Livingston by spitting on her. The court heard that during the string of attacks Jamieson was only wearing a pair of orange shorts and trainers. 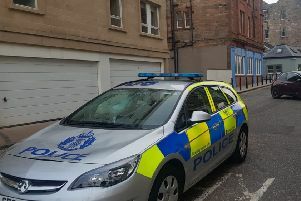 Advocate depute Margaret Barron said Jamieson had contacted an acquaintance, Gemma Wade, and asked her to pick him up from the Pilton area of Edinburgh, which she did in the early hours of November 3. They went for a drive but after Jamieson, who had been drinking wine, cider and beer, said he had nowhere to go she invited him to stay at her family home. Once there he began drinking vodka and became noisy and Miss Wade left her bedroom and closed the door. After hearing noises her father went into her room and found Jamieson lying down between a wardrobe and bed. Mr Wade pinned him to the bed but Jamieson bit him on the inside of a bicep and struggled with him before leaving the house. He was told he had the wrong door but tried to push past Mr Campbell who managed to get him back out the door. Jamieson fell and struck his face off the side of the house and walked off. He then turned up at the home of Mr and Mrs Gray. Mr Gray, who previously suffered two heart attacks, opened his front door after hearing banging. Jamieson entered and began throwing punches at his victim who fell down. Mrs Gray made a call to the emergency services. “During this 999 telephone call Mrs Gray can be heard to be clearly distressed and screaming for help. Noises can be heard in the background of the accused shouting and of glass smashing,” said the advocate depute. Paramedics arrived at the couple’s home and found Mr Gray in shock and bleeding with obvious facial injuries. He was found to have nine rib fractures and other injuries including bleeding to the brain and initially required to be fed via a tube. Miss Barron said his doctor was concerned that he would die as a result of his injuries and associated complications and said there was little doubt his life was at risk. Before the murder bid he was fully mobile and independent but it is likely that it will be a significant time before it is known whether he will fully recover, the court was told. After the attack on Mr Faulkner at Polbeth Road he was found to have sustained wedge fractures to his spine and a doctor who examined him said he may suffer chronic pain in future. Police arrived and detained Jamieson but because of his behaviour and apparent state of intoxication he was taken to St John’s Hospital and while being walked into the building he spat on the policewoman. She said that when Jamieson was told what had happened he was “horrified”. “He feels absolutely terrible knowing what he did,” she added.